A pivotal figure in the development of the textile industry in Rockville, George Maxwell moved to Rockville at the age of 30. 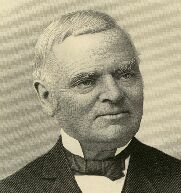 A merchant, he married Harriet Kellogg, daughter of mill owner George Kellogg. By the time of his death, he was president of the Hockanum Mill and Springville Mill, laying the foundation for the consolidation of the woolen industry under the Hockanum Mill in 1906. He also served in the state legislature, was deacon of Union Congregational Church, and founded the Rockville Public Library. The Maxwell family gave this library to to the city of Rockville in 1904, in memory of George Maxwell. Designed by prominent architect Charles Platt, the library is constructed of marble in the Neo-classical style. Architect Charles A. Platt designed this house for William Maxwell and his family in 1905. 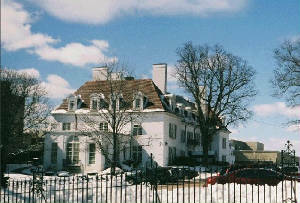 Located across Union Street from the Maxwell library, it now serves as the administration building of the Rockville General Hospital.